One of the most outstanding characteristics of eastern cuisines, that is not present in the west, is pungency. It is probably a food description that some find off putting, but believe it or not, it is that certain taste that makes food umami rich, tasty and, ironically, fragrant. A lot of Asian cuisines use fermented shrimp paste of some sort and they vary in degrees of pungency. 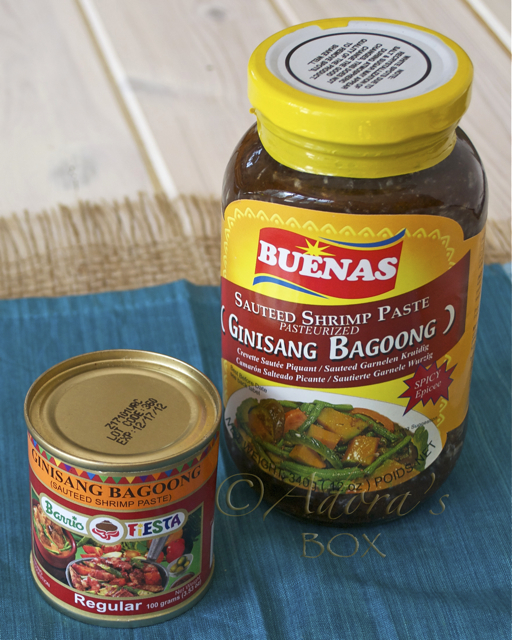 In the Philippines, the one that is most commonly used is bagoong which is fermented shrimp paste. I usually use this to replace shrimp pastes in recipes. A western ingredient that I use as a substitute is anchovy paste which is readily available in supermarkets, usually in the aisle where the tubes of garlic and tomato purees are. Anchovy fillets in oil can also be used if that is not available. 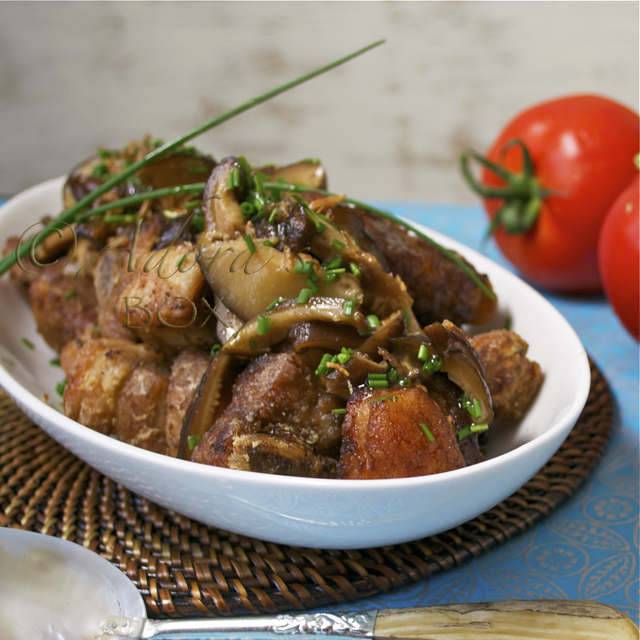 To bring out their flavour and fragrance, they have to be fried well with the other ingredients. Bagoong is an all around condiment that we Filipinos always have at a home. It is first sauteed with garlic, onions, tomatoes and fatty pork. It is then used as a dip for boiled vegetables and fresh fruits. Binagoongan (which simply means cooked in bagoong) is basically the same dish but with big chunks of pork and is eaten as a main dish with rice. This version of binagoongan is a quick and easy one, less salty but nonetheless delicious. 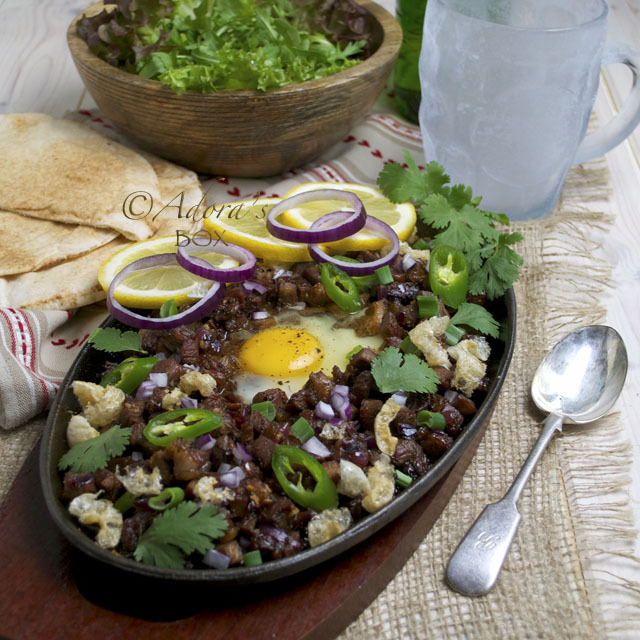 I used store bought sauteed bagoong (bagoong guisado/ginisang bagoong) which is more fragrant and convenient. 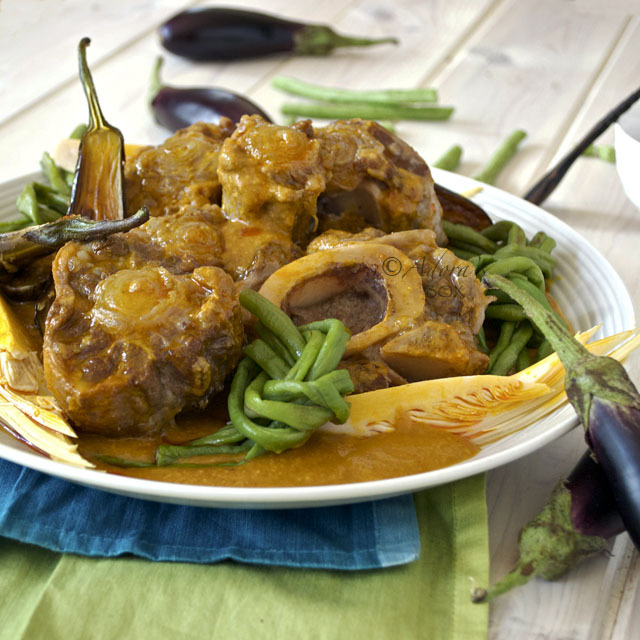 Although milder than the classic dish, it still has the undeniable flavour of bagoong. 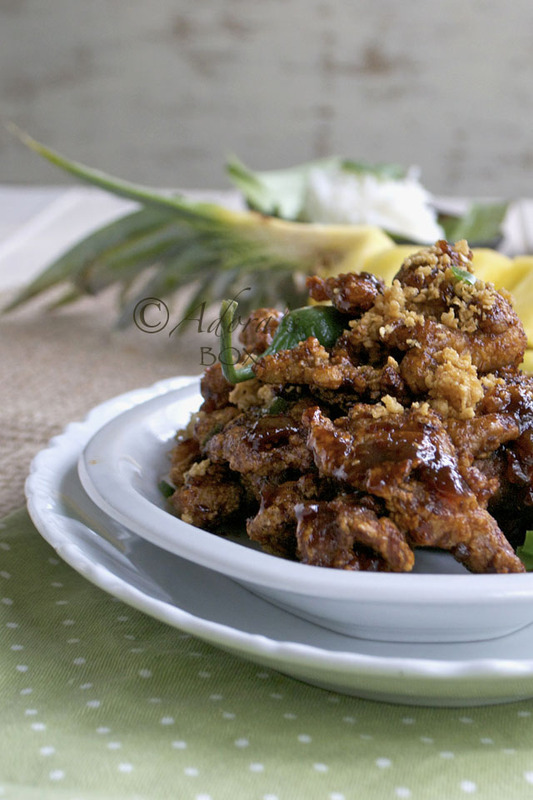 The seasoned pork strips are first deep fried before glazing in a sweet, salty and spicy bagoong glaze. It is a sure fire way to boost your appetite so get the extra servings of rice on the ready. Season the sliced pork with the bagoong, soy sauce and vinegar. Add beaten egg white and mix well. Dredge the pork slices in corn flour, shaking off the excess. Deep fry in hot oil for about 2 minutes until crisp and golden in colour. Do not overcook. The pork should have a crisp crust but still be moist and tender inside. Drain on kitchen paper and set aside. Heat up a clean wok. Add the oil and when hot, add the garlic. Fry on medium heat until crisp and golden. Skim off with a slotted spoon and set aside. Pour out most of the oil, leaving about 2 tbsps. and use this same wok for the glaze. Saute the chopped onion in the oil until soft and translucent. Add in the bagoong, tomato puree, brown sugar and vinegar. Do not stir at this point. Bring the mixture to a boil, swirling the mixture to combine. Simmer until well caramelized, thick and syrupy. Add the water and chopped chillies. 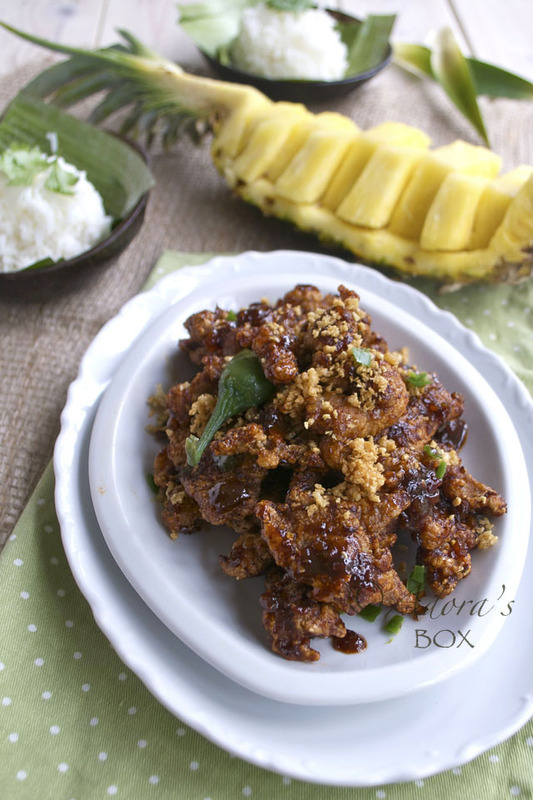 Add the fried pork to the sauce and stir quickly. Keep stirring until the sauce coats the pork pieces and forms a glaze. Transfer to a serving dish. Sprinkle with the fried garlic. 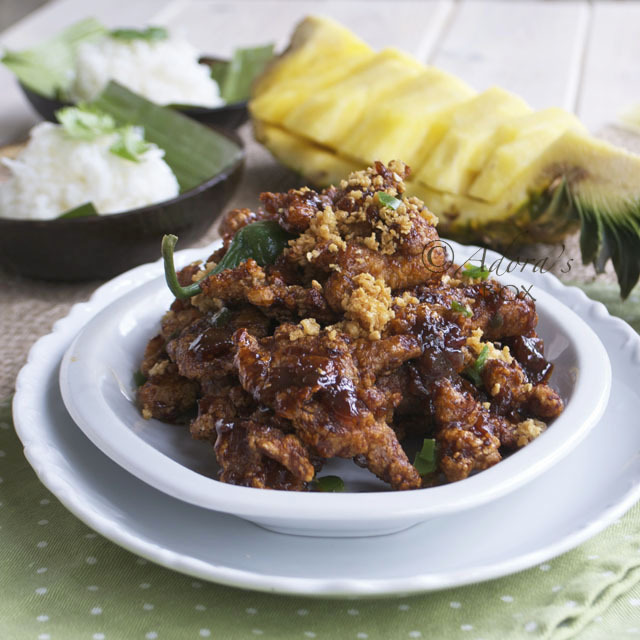 This is best served with rice and fresh fruit such as pineapple and ripe mangoes to freshen the palate. Drooling looking at this dish ......what can I say "masarap"! Those who have tasted this, they are lucky, aren't they. Yes, Mel it is masarap and I bet you'll like it if you like belacan (I do!). Thanks for visiting the blog, Albert. Will do, so watch this space. What a delicious looking dish! I cook pork shoulder quite a bit but never slice it thin and cook it. I can see how that works with this seasoning and wok cooking. I could eat a plate of this! I buy whole boneless pork shoulder from Costco (as usual) and slice it myself as I need it. It works out more economical that way. I hope you do try this recipe, MJ. Hi Abby! Thanks for the kind words. Love your blog and will be visiting again.